There are currently 74 players remaining with three more full levels to play out before bag and tag tonight. Here is a look at the 37 players advancing to Day 2 from Flight C of the $400 No-Limit Hold'em Re-Entry Event #16. These 38 will join with any players that bag in Flight B to play Day 2 tomorrow (Wednesday) at 12:00 noon. 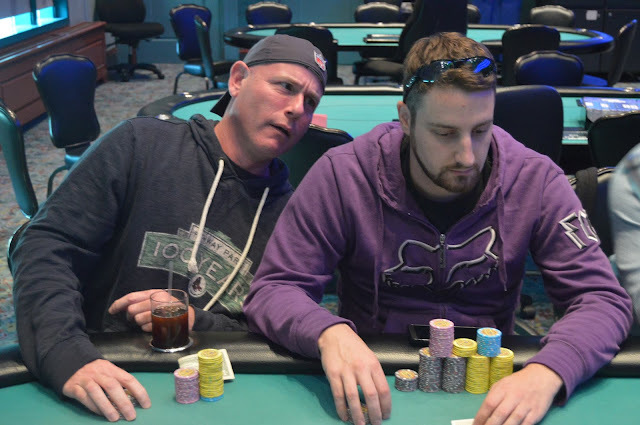 This is a best stack forward event, and we know of at least one player (that bagged over 90,000 in this flight) that has already entered into the second and final Flight B in hopes to bag an even healthier stack to carry forward. The seating assignments and final chip counts for both combined flights will not be available until very late tonight/early morning when Flight B concludes. Below is the list of all players that bagged in Flight A. The clock has been paused with ten minutes remaining, and the remaining 40 players will play five more hands before bagging and tagging for the night. After bag and tag we will bring you a list of all players advancing to Day 2 from Flight A. There is one level left before the Flight A players will bag and tag for the night. There are currently 44 of the original 214 entrants left in the field, and the current average chip stack is 97,272. According to James Magner, he recently doubled up after getting it all in with a flush draw and turning the nuts. The flop had come 2♣3♥4♥ and he got it all in for around 80,000 holding A♥J♥ (flush draw) against his opponent's A♠5♠ (flopped straight). The turn was the K♥ giving Magner the flush and the river was inconsequential. There is around 2,000 in the middle and a board reading 7♥5♣4♥ when Quan Quach checks in the big blind and The General announces that he is all in for 12,900. Quach calls and the players table their hands. The 6♥ turn gives General a pair, but the 5♦ turn fails to improve his hand, and he is sent to the cage to re-enter. A player on the button raises to 4,000 and Jeremy Meacham makes it 13,500 in the small blind. James Campbell shoves all in from the big blind and the button also shoves. Meacham asks for a count of the biggest stack and upon hearing the 62,000 total, he calls. "Please hold," the button says, but when the flop comes K♦8♦2♦ Meacham takes the lead with his pair of kings. The 3♥ turn did not change the hand and the 4♦ river only improved Meacham to the ace high flush, eliminating both Campbell and the button from play. After winning this pot, Meacham has just moved past the 150,000 chip mark. Players begin with 20,000 in tournament chips. Players are currently taking their 15 minute break of the afternoon. We will shortly have chip stacks and pictures posted.